Interestingly enough, as a middle school principal, I get more questions about college readiness from parents than you would think. I suppose this stands to reason as we tend to watch our kids “bloom” right in front of our very eyes at this age. They go through dramatic changes, both physically and emotionally/socially, and as we all know, change is not easy. I have become somewhat of an expert on the matter over the last few months. While change is an essential component to growth, it typically first evokes strong feelings of fear and doubt. As parents, when we see our little children transforming into young adults right in front of our very eyes, I suppose it is very natural for us to start to jump ahead and worry if we are doing all we can to prepare our children for what lies ahead. While parents come in all different shapes, sizes, colors, and varieties, one thing always remains constant; parents always want the best for their children. While each of us goes about this in different ways and might have different takes on what “best” looks like, when you peel back the layers, that’s the driving force behind all that we do as parents. So as these fears and doubts creep in – and let’s be honest, we all have fears and doubts from time to time – I think it is important to have an anchor that sustains us, that holds us steady so we can refocus on the dream until the fears subside. 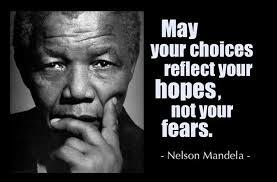 Nelson Mandela’s quote, “Let your choices reflect your hopes, not your fears” is such an anchor for me. It reminds me that I can be pushed by doubts, worries, fears, and anxiety, or I can be led by my dreams. So when your kid comes home with that less than stellar performance on a test or that poorly punctuated paper, remember that this is a journey. Absolutely hold your kids accountable and expect nothing less than their best, but also remember that learning is messy and that mistakes are our greatest teachers. When you find doubts and uncertainties creeping in – and they will – reach out to your child’s teacher to have an honest, collaborative discussion. I assure you that only good can come from these types of open conversations. Because just as all parents want nothing but the best for their kids, the same holds true of teachers. They love your children with their whole hearts and literally shed blood, sweat, and tears to ensure that all students are not only “prepared” but fulfilled. I will tell you that one of the biggest mistakes parents (and teachers) make is sitting on their concerns for fear of upsetting or offending the other party. It is in that moment we need to remind ourselves that we are team – some of the most important people in that child’s life – working together to bring out the best in every, single student. If teachers don’t know parents’ concerns, they can’t address them. And if teachers can’t address them, your worries, doubts, and fear can grow and over time squelch the dream. However, if we find the courage to openly communicate and share honestly with one another, then we can squelch the doubts before they grow into such monsters, and in the process, we can ensure that each child has the optimal opportunity for reaching his/her full potential.